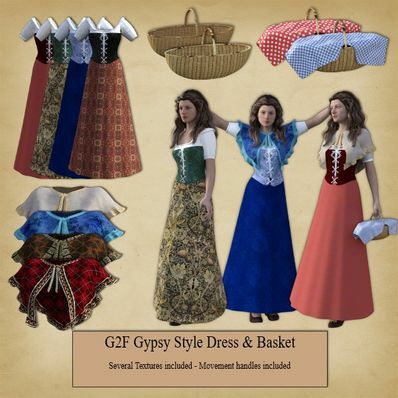 GENESIS 2 Female Gypsy Style Dress. I made this dress some time ago and never uploaded it. So I have textured it and uploaded it today. Gypsy Style Dress for Genesis 2 Female for use in Daz Studio 4.8. This is the most beautiful I have seen. I forgot that I didn't have the data installed from the file. Oops! Problem solved. Grey blocks usually mean that the item has not been installed correctly. Daz Studio is looking for the info in the Data folder, check to see if it is there. When I try to load the clothing to the scene, it appears as transparent grey blocks. Can this be fixed? Another beautiful outfit. Thank you very much! This is a beautiful dress. Thank you very much. Wonderful! Do you intend to do any more Dawn clothing? A really great set; thank you VERY much! Thank you very much. I love this outfit. Wonderful composition, looks really great. Thank you so much! Oh! Just love this outfit. The basket and cloth cover are wonderful!! You're so imaginative! Thanks so much!!! This looks beautiful. Thank you so much for continuing to support G2F!!! Always so good ! Many Thanks. Thank you , thank you so very much . This is so wonderful and its great to know the Genisis 2 females live on . So many of us just can't keep upgrading . oooh! this is really precious! thank you so much!